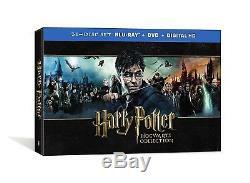 Harry Potter Blu-Ray Disc Collection Collectors Edition Complete Epic Adventure. Blu-Ray / DVD and Digital HD Set=31 Discs. 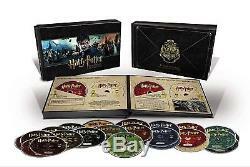 Harry Potter Hogwarts Collection (BD/DVD/UV) - This comprehensive 31-disc collection contains all eight Harry Potter movies on Blu-ray, DVD and Ultra Violet and more than 45 hours of special features including the Creating the World of Harry Potter documentary series on Blu-ray: Part 1: The Magic Begins - Explore the early decisions that impacted the entire series, and follow the search for the young leads. Part 2: Characters - Learn about the casting process and how the actors brought J. Rowling's beloved characters to life. Part 3: Creatures - Meet a new group of wizards: the artists who created the monsters and marvels in Harry's world. Part 4: Sound & Music - Hear how the composers and sound experts used their craft to magnify the series' emotional journey. Part 5: Evolution - Join the filmmakers as they discuss how the creative vision for the films evolved throughout the series. Part 6: Magical Effects - Watch how technical wizards conjured up an amazing alternate reality using CGI and practical effects. Part 7: Story - Listen in as J. Rowling and Steve Kloves discuss how the books were adapted for the screen. Part 8: Growing Up - See how the young stars' ideas of acting, fame and themselves have changed over ten years. Films Included in Collection Disc 1: Harry Potter and the Sorcerer's Stone Theatrical Version + Extended Version + Extra Content (Blu-ray) Disc 2: Harry Potter and the Sorcerer's Stone Theatrical Version (DVD) Disc 3: Harry Potter and the Sorcerer's Stone, Creating The World: The Magic Begins (Blu-ray) Disc 4: Harry Potter and the Sorcerer's Stone, Disc 2 from the Special Edition (DVD) Disc 5: Harry Potter and the Chamber of Secrets Theatrical Version + Extended Version + Extra Content (Blu-ray) Disc 6: Harry Potter and the Chamber of Secrets Theatrical Version (DVD) Disc 7: Harry Potter and the Chamber of Secrets, Creating the World: Characters (Blu-ray) Disc 8: Harry Potter and the Chamber of Secrets, Disc 2 from the Special Edition (DVD) Disc 9: Harry Potter and the Prisoner of Azkaban Theatrical Version (Blu-ray) Disc 10: Harry Potter and the Prisoner of Azkaban Theatrical Version (DVD) Disc 11: Harry Potter and the Prisoner of Azkaban, Creating the World: Creatures (Blu-ray) Disc 12: Harry Potter and the Prisoner of Azkaban, Disc 2 from the Special Edition (DVD) Disc 13: Harry Potter and the Goblet of Fire Theatrical Version (Blu-ray) Disc 14: Harry Potter and the Goblet of Fire Theatrical Version (DVD) Disc 15: Harry Potter and the Goblet of Fire, Creating the World: Sound & Music (Blu-ray) Disc 16: Harry Potter and the Goblet of Fire, Disc 2 from the Special Edition (DVD) Disc 17: Harry Potter and the Order of the Phoenix Theatrical Version + Extra Content (Blu-ray) Disc 18: Harry Potter and the Order of the Phoenix Theatrical Version (DVD) Disc 19: Harry Potter and the Order of the Phoenix, Creating the World: Evolution (Blu-ray) Disc 20: Harry Potter and the Half-Blood Prince Theatrical Version + Extra Content (Blu-ray) Disc 21: Harry Potter and the Half-Blood Prince Theatrical Version (DVD) Disc 22: Harry Potter and the Half-Blood Prince, Creating the World: Magical Effects + Extra Content (Blu-ray) Disc 23: Harry Potter and the Deathly Hallows Part 1 Theatrical Version + Extra Content (Blu-ray) Disc 24: Harry Potter and the Deathly Hallows Part 1 Theatrical Version (DVD) Disc 25: Harry Potter and the Deathly Hallows Part 1, Creating the World: Story + Extra Content (Blu-ray) Disc 26: Harry Potter Harry Potter Hogwarts Collection (Blu-ray + DVD) Item#. The item "Harry Potter Blu-Ray Disc Collection Collectors Edition Complete Epic Adventure" is in sale since Saturday, March 10, 2018. This item is in the category "Collectibles\Fantasy, Mythical & Magic\Harry Potter". The seller is "genmcdonal_6" and is located in Lexington, South Carolina.